As the wife of Osiris and the mother of Horus, Isis was the most popular Egyptian goddess. She was widely regarded throughout antiquity as the personification of the ideal wife and protective mother. Isis, like other Egyptian anthropomorphic deities, carries the symbol of her attributes on her head. 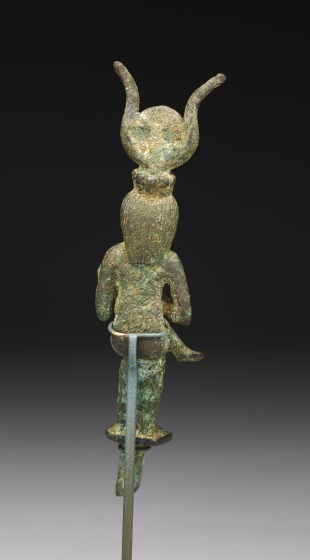 Here she wears a tripartite wig with a uraeus surmounted by cow horns cradling a solar disk, the attribute of Horus. Sometimes she is shown with a throne on her head or seated on a throne, which recalls her close association with the royal succession of the king. 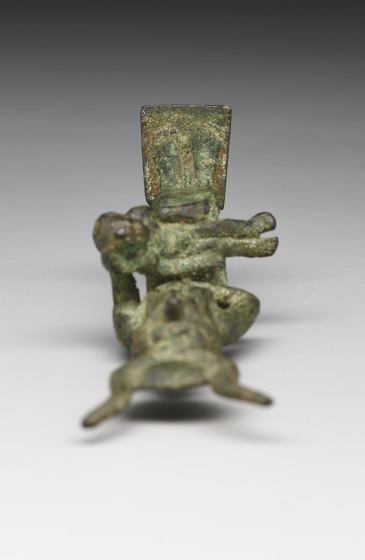 Originally, this figure would have occupied a wooden throne, which does not survive. She wears a clinging garment with her breasts bared, and with one hand she cups her left breast while she nurses the infant Horus. Isis is the Greek form of her name; in ancient Egyptian, she was called Ist, meaning "seat." Known as the "goddess of many names," she was thought to be a great magician, capable of controlling others through her magical knowledge of their names. 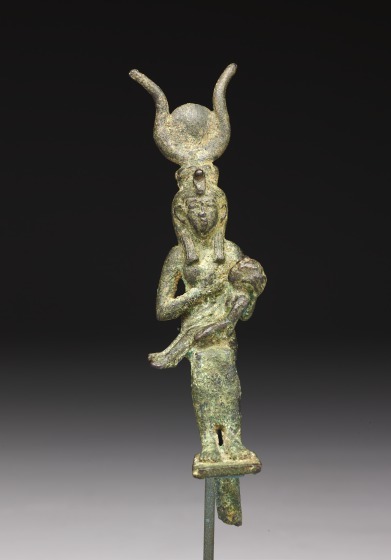 Divine mother and nursing infant statuettes are representative of the ex-voto type Isis Lactans, whose archetype can be traced to the 8th Dynasty or before and is found by the hundreds on amulets in bronze and faience after 700 BCE. After Osiris was murdered by his brother Seth, Isis helped to revive his dead body. In the cult of Osiris, the god became King of the Afterworld, while their son Horus was identified with the Egyptian Pharaoh. 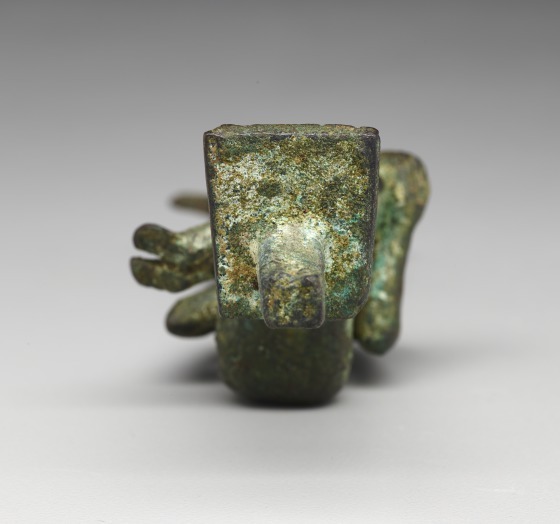 These associations of Isis, as the goddess of life and rebirth, led to the great popularity of the cult of Isis during the Greek and Roman periods. 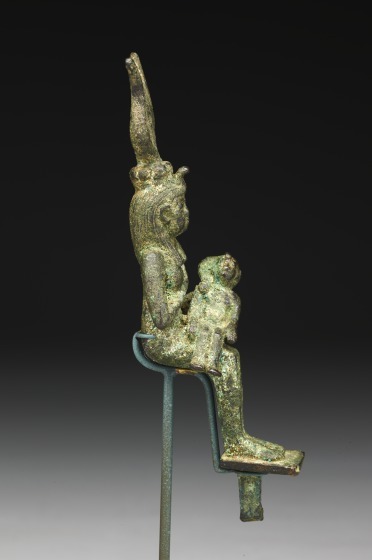 It is also possible that figures like this one influenced early Christian imagery of the Madonna and Child. 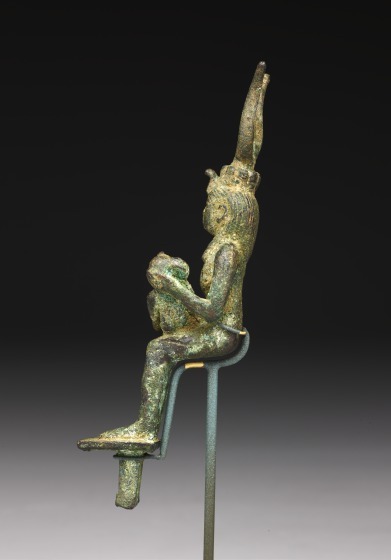 The form of Horus called Harpokrates ("Horus-the-child") was especially popular in Late Period and Greco-Roman Egypt, where he was believed to avert evil. Alan M. May, "Isis Nursing the Infant Horus" in Searching for Ancient Egypt: Art, Architecture, and Artifacts from the University of Pennsylvania Museum of Archaeology and Anthropology, David P. Silverman, ed., (Ithaca: Cornell University Press, 1997), cat. 4, 52. David B. Elliott, "Isis Nursing Horus" in Searching for Ancient Egypt: Art, Architecture, and Artifacts from the University of Pennsylvania Museum of Archaeology and Anthropology, David P. Silverman, ed., (Ithaca: Cornell University Press, 1997), cat. 15, 71. Anne Bromberg, DMA unpublished material [1997.114], May 1997. 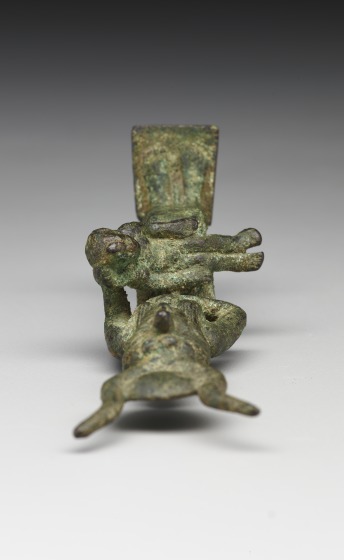 Compare to this similar version of Isis nursing Horus.